The grounds of the Gabriola Museum are encircled by Petroglyph Park. 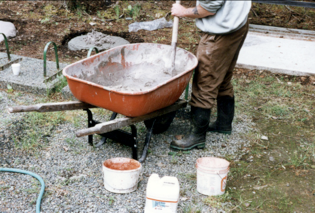 In 1996, permission to create replicas of the rapidly-eroding petroglyphs was provided by the elders of the Snuneymuxw, descendants of the First Nations, to the Gabriola Historical and Museum Society. Most of the petroglyphs on Gabriola reside on private land and are inaccessible to the public. The Museum Petroglyph Park enables residents and visitors to view the sacred carvings and learn about the Island’s early inhabitants. More information on Gabriola’s rock art is available in Gabriola:Petroglyph Island by Mary and Ted Bentley, c1981, 1998. Copies are available for purchase in the Museum Gift Shop. 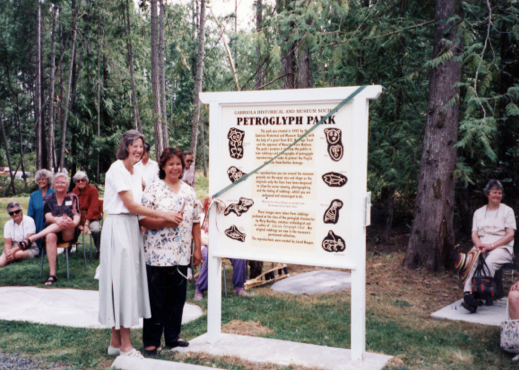 Mary Bentley, author (left) and Geraldine Manson, Snuneymuxw elder, (right) cutting the ribbon at the Park’s Opening Ceremony, 1996. Petroglyphs are the records of a people with no written language, and are rare links with the past culture of our First Nations. They record coming of age ceremonies, commemorate potlatches, marked the boundaries of hunting and fishing territories, and may have been part of secretive shamanistic rituals. A few were records of disaster: floods, landslides, storms, and wars. There are more than 70 known petroglyphs on Gabriola and the surrounding islands. Carved into large sheets of sandstone bedrock or on isolated boulders, they occur in groups or singly…some at the tide line, others well back from the shore or on hillsides above. Some are deeply incised, others barely visible. Some are realistic, others are combinations of human and animal shapes. Still others are indecipherable. Most lay hidden under layers of soil and moss until the 1970’s, when Gabriola’s population began to grow. Petroglyphs appeared during home excavations and road construction, discovered by loggers and eventually scientists. Locations for rock art carvings were carefully chosen. They were places of power or mystery; places where the forces of nature were believed to be especially strong. They are marked by unusual natural features such as waterfalls, rock formations, or or caves. Nearly all sites are near water and may also be near village sites or along trails or ancient trade routes. Publicly accessible petroglyphs can be observed along a pathway behind the Gabriola United Church. How old are the carvings? The age of very few petroglyphs is known – and they are among the most recent. Of the 300 or so sites on the BC coast, fewer than 30 can be dated, and most of these are approximate estimates at best. A few designs were made as late as the 1920s. It is, however, extremely unlikely that any existing petroglyphs are very ancient since the natural forces of erosion – washing tides, abrading sand and gravel, wind, sun, rain, frost, and vegetative growth – would have destroyed early designs long ago. Field researchers often find vestiges of carvings and faint traces of paints too weathered to be analyzed. Estimates of the probable age of existing BC rock art range from less than a century for some to a maximum of 3,000 years for others. An outline of the carving was first “pecked” out on soft sandstone as a series of small holes, using a sharp pebble. 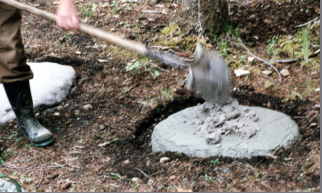 After the outline was complete, the holes were joined into a groove by abrading the stone between them, possibly with the same sharp pebble. 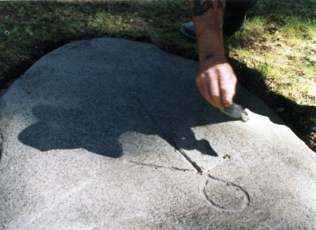 In 1996, the Gabriola Historical and Museum Society, with other groups on and off Gabriola, became increasingly concerned about the condition of the Island’s petroglyphs. The soft sandstone on which they are found is exposed to weather, traffic, rubbings, and vandalism. Some images had become much less legible as a result. The petroglyphs are scattered all over the island, making protection and preservation difficult and expensive. The Gabriola Historical and Museum Society acquired permission from the Snuneymuxw First Nation to place these in a small park on the Museum grounds. In 1998, more than thirty reproductions, ranging in size from 50cm x 50cm to 2m x 3m, had been placed around the Museum. A 1998 interpretive sign that speculated about the history of the petroglyphs is currently being revised with input from the Snuneymuxw. Please note that the original petroglyphs are fragile, and there are penalties for defacing them. The Snuneymuxw have requested that no photographs or rubbings be taken of the petroglyphs. All petroglyph sites in BC are protected by law. Next, the image was transferred from the petroglyph. Finally, the transferred image shape was carved out.